Hockey is back! 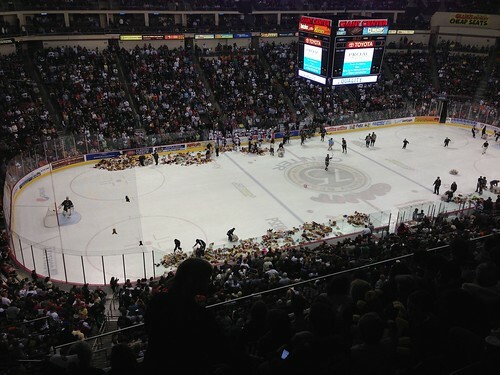 Bear Toss last year. In preparation for todays games, here in the next 45 minutes, Hockey is back! While not exactly happy with the owners, the players aren’t without fault entirely, but definitely more so the owners. Here’s a picture I took back on December 1st when the wife and I decided that during the lock-out we’d go watch an AHL game, it was the Bears vs the Norfolk Admirals. The Bears lost, 1-5, which sucked. However, a bright point during the night is that it was bear toss night, what happened is when the Bears scored their first goal, everyone has these stuffed bears that they brought to the game, and then they throw it out on the ice, much like a hat trick where when a player scores three goals in a night you throw your hat on the ice. Unlike throwing your hat on the ice, you don’t get your bear back. Anyway, this is the picture I took after about 15 or so minutes when cleanup started. 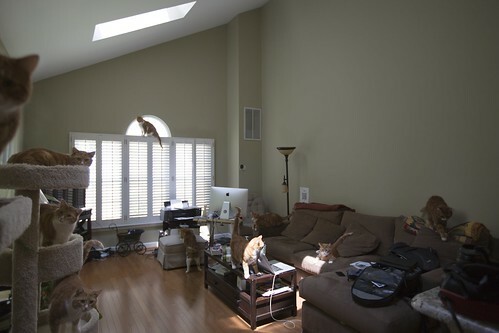 They kept cleaning up for another 10 to 15 minutes.